A collection of new enemy-themed skins created by our talented community are now dropping in the Coliseum. Will you find one during your hunts? We've drawn a few more winners from our most recent Coliseum Skin Contest! Dragons with a level 10 or greater skill in hunting now have a chance to gather these elusive familiars. 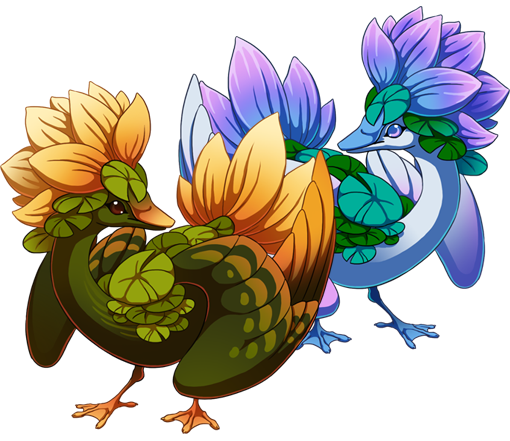 Paddyfowl are often a nuisance for Sornieth's smaller amphibians, who mistake the paddyleaves along their body as gentle places to rest. This fascinating fowl can actually breathe through the plant-like growths along its head and back, which is helpful considering it spends most of its time partially submerged. A successful chemist keeps their herbs and supplies well organized; a new vista has been discovered at Baldwin's Bubbling Brew! This recipe may only be undertaken by alchemists level 21 and above. We wanted to inform everyone of a "micro-holiday" we'll be running next week we're calling Drakeharvest. Drakeharvest will include a couple new familiars (they will not be exclusive to the event, just debuting then), a 50% coliseum experience boost, and every current possible loot item that is plant food will drop more frequently than normal. Because this is a limited time event, we wanted to make sure everyone was aware it was coming! Switching forum vistas is easier than ever! Preview all your vistas at once under Account Settings. User Search should no longer only display one (1) page of search results. The error window shown when a dragon name is ineligible has been reworded to be less confusing. Several typos have been fixed. Players will now receive an alert if a brew they started in Baldwin's Bubbling Brew has completed. edit: @Xhaztol , it looks like the dressing room BG update might be missing from the update list? Love the mini event too! Drakeharvest sounds very neat!! super looking forward to more site-wide events that aren't festival related. Looks great! Love the Baldwin's alerts. "Be writing what just happened on your pages, Mr. Q. That today Nightlight, the boy Guardian, had the knowing of a Tall One." FR+3. College student. Dog lover. Fantasy and scifi buff. She/her. i love the little duck pals and im super excited for drakeharvest! !